Herencia, S/N, 13600 Alcazar De San Juan, Spanje. Spa-hotel in Alcázar de San Juan. 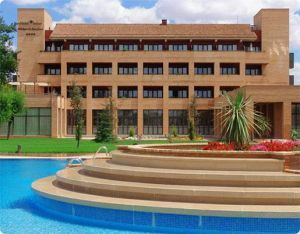 Located in the beautiful locality of Alcázar de San Juan, in the Ciudad Real province, the Intur Hotel is the perfect place where to relax after enjoying the touristic attractions of La Mancha. Having the beautiful landscape of this region as background, this 4-star spa-hotel is situated in a big garden that allows the guest to enjoy the surrounded nature. Following a rustic style, all the facilities are conceived in order to envelop the client into a warm and friendly atmosphere of the hotel. Among its facilities it has a complete spa where to enjoy different treatments, relaxing and renewing outside and inside. 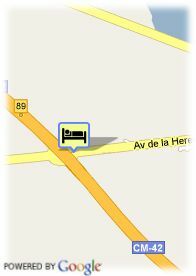 It also has a magnificent restaurant where to enjoy the tastiest dishes of the cuisine from La Mancha. Very close to the famous Alcázar de San Juan castle, it is the ideal place if you want to enjoy the time in this place full of history and spectacular monuments.